I haven’t been updating my News page much, because most of the news is in other pages of this site: Upcoming Appearances, Blog, and Articles. August 12, 2016: I’ve been quiet lately because I’ve been focusing on writing my third book. February 15, 2016: I’ll be speaking at Vassar College on Wednesday, February 24, 2016, 5:30pm. Title: “What It’s Like to Go Deaf and Get Your Hearing Back With an Implanted Computer (And What That Means for Theory).” I’ll also be having a conversation with Trevor Pinch on Thursday, February 25, at 7:00pm. Details here. December 17, 2012: New blog entry: How To End Gun Violence. November 26, 2012: Do Super-Earths Trap the Civilizations On Them? Turns out gravity isn’t destiny. November 15, 2012: New blog entry: Do Super-Earths Have Too Much Gravity For Us? November 7, 2012: New blog entry: A Status-Quo Election, But Much Cause For Hope. November 4, 2012: New blog entry: The Revolution We Can’t Imagine. September 12, 2012: New blog entry – Workstations of the Future. September 2, 2012. An interview with me on Skeptically Speaking is up on the web, here. It was a fun interview, ranging widely over topics connected to my book WORLD WIDE MIND. August 11, 2012: I’ve been doing even more blogging on SETI. There’s several new entries; see blog page. July 24, 2012: I’ve just put up three new blog entries on the search for extraterrestrial intelligence. See the blog page for links. July 14, 2012: In November 2011 I gave a talk at the International Neuroethics Society titled “Technology and Humanity: A Neuroethics Perspective.” It’s up now on Youtube. I tried out some new ideas in this talk that may work their way into my third book. June 11, 2012: Two new TV appearances of mine are now up, one at TechZombie (11 minutes) and another on the Hungarian television series “Babel.” I was interviewed by the delightful Hesna al Ghaoui, who used to do war-zone journalism but switched to technology. It’s an hour show, and I’m on at 7:45 to 13:10. If you ever wanted to hear me dubbed in Hungarian, now’s your chance. March 20, 2012. I’m very pleased to see my new article, “Waiting for the Bionic Man,” in the April 2012 issue of Wired. Now online here! March 12, 2012. I just got back from giving a lecture at Georgia Tech titled “How to Put Your Brain on the Internet.” The YouTube video is here. January 20, 2012. I’ve just stopped writing “2011” on my checks, so I must have accepted it’s 2012. Much is going on, with seven talks scheduled for the spring and more in the works. After a magazine-publishing hiatus, I’m back in the game with a story in New Scientist titled “The Ascent of Life” (web version: One-way evolution: The ladder of life makes a comeback.) I have a Wired story on prosthetic arms in the works for the April 2012 issue, and am reading tons of books on psychology, anthropology, evolution, and astrobiology to spin up for a proposal for my third book. December 3, 2011. I wrote up a blog entry about the pepper-spraying at UC Davis and it’s been a huge hit, with 55,000 page views so far. And here’s a video of me giving a talk at the International Neuroethics Society in Washington D.C. in this month. This was a very different talk from the ones I usually give; I was laying out some ideas I’ve been considering for my third book. Then we visited Rome, Florence, and Venice as tourists, spending 3-4 days in each city. I put up about 70 pictures on my Facebook account; feel free to friend me to see them. Then we went to the italian Science Festival in Genoa, where I gave a talk (dubbed in Italian, here) and did a short video interview afterward (in English, here.) We had a great time and are very grateful to our French and Italian hosts for making this trip possible. Also, I was interviewed by the Italian newspaper La Stampa. The story’s titled Mi presento, sono un cyborg. June 29, 2011. I was interviewed on PBS Newshour’s story on bionic body parts last night. I’m on from minute 7:40 to 8:30. The auto-captions sort of work, and there’s a link to a transcript. It was fun to watch myself, but even more fun to watch my wife Tory onscreen with me. There’s a short clip of us talking in the kitchen. June 18, 2011. The Irish Times posted an interview with me today. “Brain-to-brain communication is the standard stuff of science fiction, but Chorost attempts to outline the engineering path towards feasibly realising this much-fantasised communicative ability and, more importantly, he explains how it could deepen human communication. Yes, there are several science bits that you can’t really skip, but the surprising thing is that, even to this non-techie, Chorost makes it so readable and convincing.” Read the article. May 16, 2011. I was interviewed on Dr. Kiki’s Science Hour last week; no cats stole the show this time. Also, Civil Engineering published a nice review of WORLD WIDE MIND in their May 2011 issue. May 9, 2011: I was interviewed by The Calcalist, an Israeli site attached to Yediot Aharonot. It’s in Hebrew, but Google can sort of translate it. They say I look like Woody Allen. Really? May 3, 2011: Here’s the Track180 interview with me where our cat Harper totally, totally stole the show. No one’s even going to listen to me talking in this one. April 25, 2011: Here’s a fun video of a 20-min Learning Annex lecture I recently recorded, on what kinds of mind-reading are possible with current technology. There’s a followup 15-minute lecture in which I talk about what might be possible in the future. These short courses shows off some of the ideas of WORLD WIDE MIND. The first one’s free; I think you have to pay 99 cents to watch the second. April 21, 2011. New blog entry: “Are We Alone in the Universe?” Surveying a few recent books on the search for extraterrestrial life. April 10, 2011. Listen to me on Wisconsin Public Radio’s show “To the Best of Our Knowledge.” My segment runs from 28:38 to 39:00. To listen, click here. For a description of the episode, click here. March 28, 2011. SEED Magazine has just published Chapter 1 of WORLD WIDE MIND. Read it there. March 22, 2011. I had an enjoyable conversation with Andres Martinez of the New America Foundation yesterday. See the archived webcast. 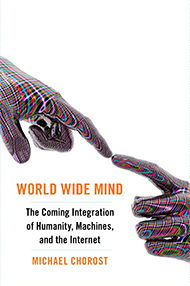 March 12, 2011: Five enthusiastic reviews of WORLD WIDE MIND: New York Times, New Scientist, Big Think, The L Magazine. Appletell. See them here. March 1, 2011. Three interviews with me have just come out. See the bottom of my bio page for links to them. February 28, 2011. Natalie Valentina Cassetti very kindly captioned my author video in German. See the German-captioned video here. Here’s the author video for WORLD WIDE MIND. My author video for WORLD WIDE MIND, February 2011. BookTV, July 11, 2005. This is a book reading I gave in Seattle. This is a talk I gave at Google, July 11, 2008. The Exploratorium. This is an educational segment I filmed to explain how cochlear implants work. Technology Review, Winter 2007. This is a video where I explain how fully implantable hearing aids work. I filmed this to accompany an article I wrote for Technology Review. Interview with Robert Bloomfield, a professor at Cornell, in Metanomics at Second Life, December 6, 2010. Michael Krasny’s Forum, June 23, 2005. Weekend Edition, July 10, 2005. Talk of the Nation, October 12, 2006.